The key to surviving a heart attack is to recognize that you might be having one, then getting medical help as rapidly as possible. An acute heart attack (also called a myocardial infarction, or MI), is caused by the sudden blockage of a coronary artery, which causes at least some of the heart muscle supplied by that artery to die. Many of the short-term and long-term consequences of a heart attack are determined by how much of the heart muscle is damaged. So once the artery becomes blocked (that is, once an MI begins), it is critical to get the blocked artery opened up as quickly as possible. This fact is worth stressing. During a heart attack, getting rapid treatment is the critical thing. A matter of minutes can make the difference between a full recovery, or permanent disability or death. Unfortunately, the natural human impulse is to deny and delay — and in the case of a heart attack, this can be a fatal mistake. If you are having the symptoms of a heart attack, trying to ride it out at home for a while — hoping the symptoms will turn out to be indigestion or a muscle strain — might lead to devastating and permanent consequences. The key to surviving a heart attack is to recognize the possible symptoms of a heart attack, and to take quick action if you experience any of them. The most dire consequences of a heart attack are usually avoidable if treatment is instituted quickly. Anyone who has coronary artery disease (CAD), or who (by virtue of their cardiac risk factors ) might have CAD, should know what symptoms to look for. 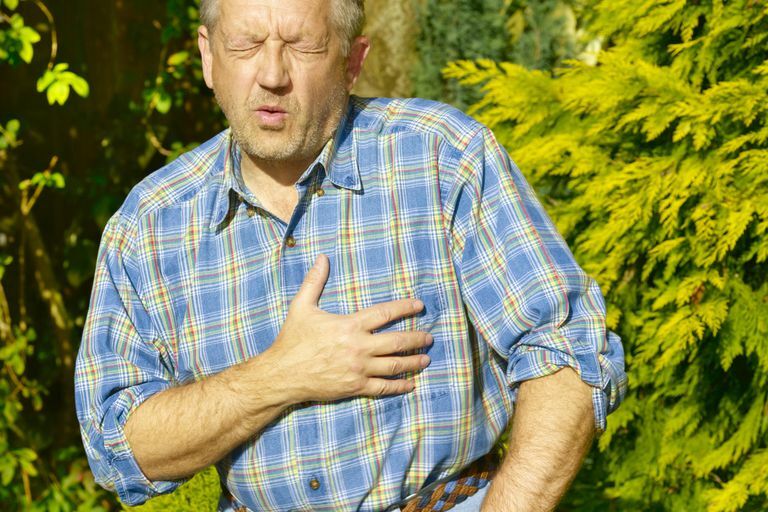 What Heart Attack Symptoms Should Tip You Off? Many heart attack victims describe the chest discomfort as fullness, tightness, burning, a knot in the chest, or a weight on the chest. In other words, actual “chest pain” may not be perceived at all. The chest discomfort is sometimes accompanied by profuse sweating, or a nearly overwhelming sense of fear or impending doom.. Unfortunately, you can't count on having this classic pattern. Sometimes the discomfort may be relatively mild, and may be felt in the back, abdomen, shoulders, or either or both arms. Unexplained sudden shortness of breath, nausea and vomiting, or merely a feeling of heartburn, may be the predominant (or only) symptoms. Such "atypical" symptoms may not make you think of a heart problem at all, and may keep you from seeking medical help. It is noteworthy that women appear to experience "atypical" symptoms more often than men. This often leads women to delay seeking medical help, and may even cause doctors to delay in making the correct diagnosis. This is one reason that women, in some studies, have tended to have worse outcomes with heart attacks than men. Read more about CAD in women. The bottom line is that anyone who has one or more risk factors for CAD needs to pay close attention to any sudden, unusual or unexplained symptoms involving the upper half of the body. This warning would apply, for instance, to any middle-aged (or older) person who is overweight, relatively sedentary, a smoker, or who has diabetes, high cholesterol, high blood pressure, or a family history of heart disease. For such people (and there are a lot of us), any unexplained symptoms that even might be due to a heart problem should be regarded very seriously. Anyone who has one or more risk factors for CAD needs to pay close attention to any sudden, unusual or unexplained symptoms involving the upper half of the body. What Should You Do If You Think You Might Be Having A Heart Attack? If you experience any symptoms suggestive of heart attack, especially if you know you have risk factors for CAD, you should get medical help as soon as possible. Generally, the safest thing to do is to call 911 and have the paramedics come to you. Once you are in the care of medical professionals, your risk of dying is greatly diminished. If you live in an area where paramedics are not readily available, then have someone drive you to a hospital. But whatever you do, get help right away, because if you are having a heart attack, every minute is vitally important. And while you're waiting for the paramedics, or while being driven to the hospital, take an aspirin. What Should Happen At the Hospital? When you arrive at the hospital, the medical personnel should take your symptoms very seriously. This is not one of those times when you should expect to sit around in the emergency department for two hours, waiting for a sullen, gum-snapping clerk to take your insurance information. Instead, you should expect to be immediately placed into a treatment room, and several individuals should simultaneously hook you up to a cardiac monitor, start an I.V., give you some oxygen, get an electrocardiogram (ECG), draw some blood to test, and begin asking you questions about your symptoms and examining your heart. To make sure you elicit the correct response from medical personnel, you've got to say the magic words as soon as you arrive. The magic words are, "I think I'm having a heart attack." Don't tell them you're here because your shoulder hurts, or you think you have heartburn, or that you have any of the other alternate possibilities you've imagined (and hoped) for yourself. Your attitude should not be, "It's probably nothing, so I won't make a big deal. Let them figure out if it's my heart." If that's your approach, you'll get the sullen, gum-snapping treatment, precious minutes (or even hours) will be wasted, and you'll pay a heavy price. Once you have recognized the symptoms of a possible heart attack, gotten yourself to a hospital, and alerted the medical personnel that you may have a heart problem, you've done your job. The next step is up to the doctors. And it's important for you to know, in general terms, what the doctors ought to be doing for you when are having an acute heart attack. You can read more about heart attack treatment here. The key to surviving a heart attack is to recognize the possible symptoms of a heart attack, and to take quick action if you experience any of them. The most dire consequences of a heart attack are usually avoidable if treatment is instituted quickly. Today, most modern hospitals are geared up to deliver treatment rapidly once the diagnosis is clear; and most of the delay in beginning treatment is in the hands of the person having the heart attack. So, especially if you have risk factors for CAD, know what to look for, and be alert to any possible symptoms of a heart attack. Thygesen K, Alpert JS, Jaffe AS, et al. Third Universal Definition of Myocardial Infarction. Circulation 2012; 126:2020. Body R, Carley S, Wibberley C, et al. The Value of Symptoms and Signs in the Emergent Diagnosis of Acute Coronary Syndromes. Resuscitation 2010; 81:281.